Hello people! A new year begins with a whole year of the Friday Fictioneers to look forward to! I hope everyone had a wonderful New Year’s eve and rocked in the New Year like you wanted. Now today is for relaxing and getting ready to tackle this brand new, sparkly new year the way YOU want to! That’s what I’m doing. Anyway, most of you know the drill by now, but if I have any new readers, Friday Fictioneers is where a bunch of very talented writers get together every Friday (it actually starts on Wednesdays) to write a 100 word story based on a picture that some kind soul lets us borrow. One picture, lots of writers writing stories based from the same picture. What you get is a wide range of stories that will make you smile, cry, laugh, shudder (in fear), gasp, shake your head at, and marvel that so many stories can come from one source. 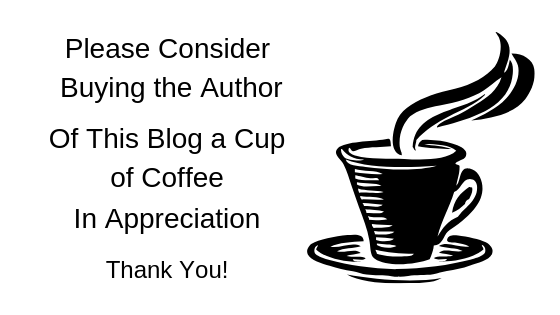 Thanks go out to Rochelle Wisoff-Fields for being the kind and benevolent hostess that she is. If anyone is interested in joining us, please click on her name and read her blog for the few rules we go by. If you just want to read many great story tellers, again click on her name and scroll down to the little blue guy and click on him and then read to your heart’s content. The picture this week is from Rochelle’s daughter-in-law. 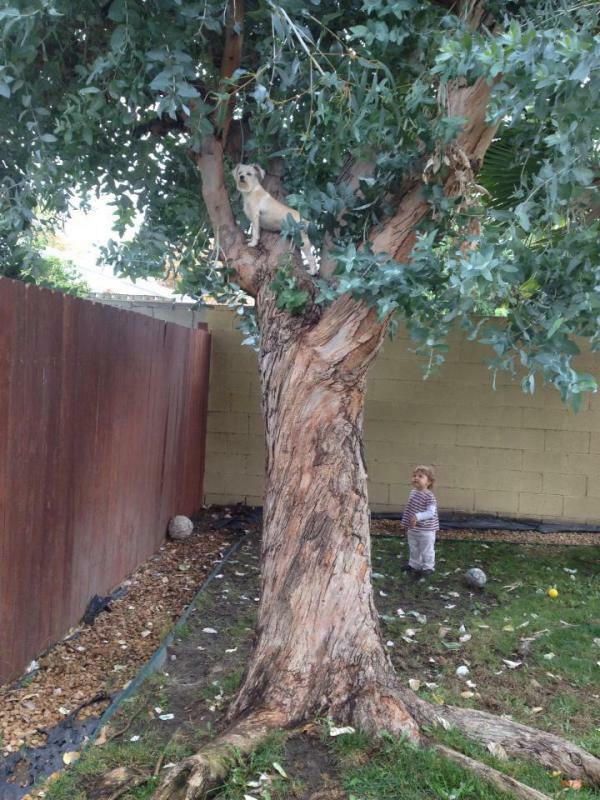 It’s Rochelle’s grandchild and the dog actually climbs the tree! I believe her as I had a dog who loved to climb trees too. Then she would jump onto the roof of the house and that’s when I would have to rescue her. She could climb trees and come down from trees, but once she was on the roof (one big tree was close to the house) she was helpless. But she was on the small size and would jump right down into my arms. I miss that dog! Talking dogs, cats, mice and babies. Great job Jackie. First, the picture is fantastic! Lovely Jackie, I think Ralph is such a good dog name. And talking dogs, what great imaginations we have. Loved this one well done. Ralph is a perfect name for a dog. Thank you Michael. We do have some pretty great imaginations don’t we. Shhhhhhh let’s keep that between us. People will begin to expect things. Have a good evening. I like the fact that Ralph the dog thinks next door’s cat is crazy. Nice touch. Thanks Mike! I always believed most dogs think cats are a bit crazy. Haha very cute! That photo is crazy… I look forward to seeing everyone’s take. Well that’s so farfetched. My dog talked to me and I’d bet yours talks to you. The first dog I had actually moved her lips to try to make the words. Cute story. Good way to start the new year. Fun story of a kid and a dog. Jackie, I can just see them, one riding the bike, the other flying along next to the bike. What a great picture! Have a great 2014. Thanks Janet! I could see it too in my mind. 🙂 Have a wonderful New year! People just don’t call their kids Ralph these days. Wonder why that is…. What if you wanted to call your kid George Washington so and so? That George w was a kickass prez ‘but you got the whole George w thing going again. Better off sticking with Ralph. A nice whimsical tale, full of anticipation. Nicely done Jackie. Now all Ralph needs is a mate named Alice and you can call them the Kramdens. 😉 Cute, imaginative story. Makes me smile. Lovely. I hope the new bike doesn’t replace the doggy pal. Oh I doubt it. Ralph will be running beside her and they will be having adventures together. Thanks for stopping by Liz. This is soooo GOOD! We are “special kids” 🙂 aren’t we? You know it tiny! 🙂 And thank you! Fun piece. I wonder what the mouse was saying? Probably Please don’t eat me! haha! Thanks for stopping by Patrick. Oh sweet, Jackie. I wish I could talk to animals. I know my cats are having full on conversations with each other and I can just bet they’re talking about me! I love the new look of your blog!